Joy De Vivre Design: My wish has finally come true! I have a very eclectic taste in music. 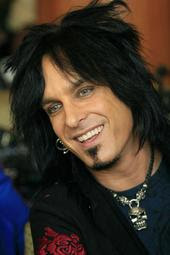 My favorite type of music though has always been rock and Nikki Sixx of Motley Crue has been my favorite rock dude since I was twelve years old. My mom was not very happy when I threw out my Barbies to make room for tapes,(it WAS the 80's), black t-shirts and pictures of men in makeup all over my walls. He has a really inspiring book out and a great new album.